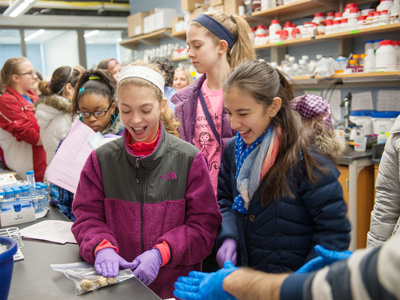 The outreach program is sponsored by Northwestern’s McCormick School of Engineering and Applied Science and the University’s chapter of the Society of Women Engineers. The popular event will include an engineering design competition, laboratory tours, hands-on experiments, a goal-setting workshop focusing on different engineering majors, and separate panel discussions for high school students and parents. Throughout the day, young women will have an opportunity to meet current female engineering students, faculty and alumnae. Check out the action at the 2014 Career Day for Girls: http://www.youtube.com/watch?v=v0ta_QH8LLU. Northwestern alumna Cindy Kent, president and general manager for 3M Drug Delivery Systems, will kick off the program with a keynote address from 9:15 to 9:45 a.m. in the Technological Institute’s Ryan Family Auditorium. Career Day participants will begin with a design competition (9:45-10:30 a.m.) followed by lab tours (10:30 a.m.-12:30 p.m.). The young women will, among other things, draw a picture using bacteria, conduct a “murder” investigation using engineering, view actual atoms using a magnification of 10 million, study rat whiskers, explore 3-D printing and view a spinning bicycle wheel that defies gravity. In the afternoon, middle school students will rotate through three different hands-on activities (1:15-3:30 p.m.), and high school students will choose among four interactive panels about various aspects of engineering (1:15-2:30 p.m.). After their panels, all high school students will participate in a mini-design competition (2:30-3:30 p.m.). Career Day has been held at Northwestern annually since 1970, when only 4 percent of the students in the McCormick School of Engineering and Applied Science were women. Today, nearly one-third of McCormick students are women.